Home » To Whom Belong Serbian Assets in Kosovo and Metohija? There is an army of people in Serbia, popularly called “bots”, who, or perhaps it is better to say "which", are in charge of defending their Supreme Bot, i.e., the US/UK/EU/NATO political frontman Aleksandar Vučić. These bots are trained in the local offices of the Serbian Progressive Party to maintain an online presence and counter-comment everything posted against their beloved head bot. They are second grade slaves, while their boss is a first grade slave. He can be proud of himself for being first grade in at least something. These bots all receive strict instructions on what and how to write, what topic is hot, and which websites pose a “big danger” to the PM's public image. It might be redundant to mention, but anyway, these bots are brainwashed converts (from Radicals to Progressives, from anything else to Progressives, while the first are ideologically brainwashed – again, the later are just brainwashed). It is not that they really care about online communication. Most of them are computer and Internet illiterates. They make accounts (or someone makes them accounts) that have cute names and pretend to be “ordinary people." They read their instructions and then strike. Their worst enemies are those citizens of Serbia who dare to say something else, something different, and who think differently. This is in absolute accordance with the behaviour of their Supreme Bot. The prime minister is also very dissatisfied with Serbian citizens and never misses a chance to insult them, to shout at them from TV screens, and to launch into tirades directed against journalists present at his almost daily media conferences. He advocates for Albanians, Merkel, his attendance at the Clintons' event, and his fellow criminals from the Belgrade city authorities. He defends the totally insane Minister Alekandar Vulin, the Trillateral's Commission quasi-Orthodox, Minister Mihajlović (who celebrates Serbian Slava at Hyatt Regency hotel whose main guest is ex-US Ambassador Kirby. They might as well have all gone to some shopping mall). Then, the Supreme Bot makes some deals. 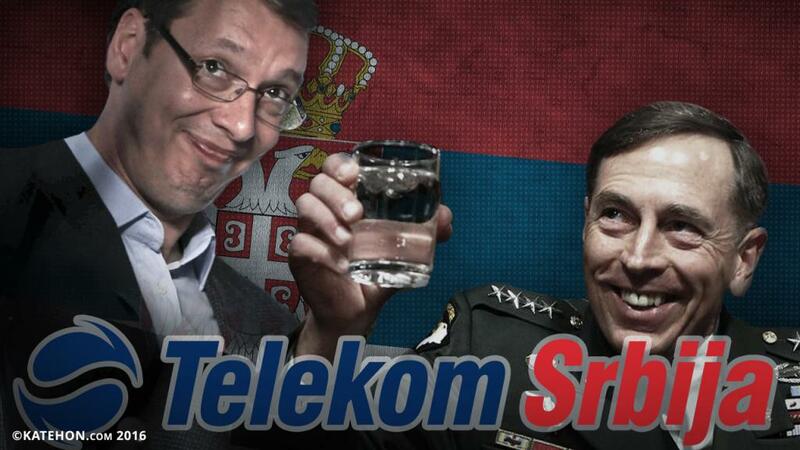 Once Aleksandar Vučić became a powerful slave, David Petreus, the US General world famous for leaking confidential data to his mistress who later published a book, has taken over several important telecom and media businesses in Serbia. David Petreus also has businesses in other parts of Balkans just as Wesley Clarke and Madeleine Albright do. But let us focus on Kosovo and Metohija, where American officials have started to expand their businesses. After the shameful bombardment of all of Serbia, including Kosovo and Metohija, where NATO was defeated but is still afraid or ashamed to admit such, the dissolution of the assets of the Republic of Serbia was officially initiated. This was done first through private acquisitions and then, after the establishment of the criminal and terrorist fake state of Kosovo, through this false state's legal procedures. Even right after the bombardment, information surfaced that Madeleine Albright intended to expand her US-based telecom business to Kosovo. This was a lucrative plan especially given that NATO had bombed infrastructure of all kind there. This was first seized upon by some smaller companies and proxies and then, later, both Bloomberg (http://www.bloomberg.com/news/articles/2012-08-30/albright-firm-eyes-kosovos-contested-state-telecom) and the Belgian Serbian Business association (http://bsbiz.eu/?p=1615) wrote on their websites that their companies had set their eyes on Kosovo's state telecom company. But with which state telecom company and with what and whose infrastructure was this to be done in 2012 if the talks on Kosovo's telecom infrastructure were not finished yet? What about now, 2016? This says a lot about their plans and their ambitions to accomplish such by all means. Of course, it is not possible for only the US State Department's employees to benefit from some war. There must also be some pieces of the cake for the Pentagon's staff. Then comes Wesley Clarke. He set his eyes on another kind of infrastructure: coal mines. By chance or not, in the same year (2012) when Mad eleineAlbright announced her interest in Kosovo's “state” telecom company, Wesley Clarke announced his interest in a coal project in Kosovo (http://www.marketplace.org/2012/10/26/world/new-petro-state/wesley-clark-puts-name-behind-kosovo-coal-project). He did not bomb for nothing. He did not help drug dealers and human organ merchants because he is an honourable soldier like them. No, they are all together in a heavy crime syndicate pretending to be a regular state - from the US to the false state of Kosovo. After every war that Washington and London wage, there is business for the organizers of war. And not mere small business. Being megalomaniacs, they accept nothing less than entire countries' assets, as in the case of Serbia. The newest theft is connected to Serbia's telecom infrastructure, that very one in Serbia which is half-controlled by David Petreus, while the other half is owned by the poor Serbian state (Telekom Serbia), which itself is further controlled by Deutsche Telekom. This is in Central Serbia. In the Southern Serbian province of Kosovo and Metohija (under US/UK/EU/NATO occupation at the moment), this robbery is done via Brussels. There is a long history of clashes regarding telecom infrastructure in Kosovo. During all the theatrical performances synchronized between terrorists from Kosovo who were given a state to run and their robot bosses from Brussels, Serbia is blackmailed again and again. We are dealing with the telecom infrastructure in Kosovo and Metohija which is entirely made, built, produced - whatever word one wants - by Serbia before the wars in the 20th century over the course of both the Kingdom, SFRY, FRY and today's Republic of Serbia. Earlier this year, in August, the head of the Serbian government office for Kosovo-Metohija, Marko Djurić, said that even after 20 hours of talks, no deal with the “Priština side” had been reached on implementing a deal on telecommunications. Before that staged meeting in August, the representative of the “Priština side” announced that Kosovo is acquiring its own international telephone country code – again, this was announced before the meeting. But, after the meeting, the outcome was different. Of course, the representative of the terrorist and drug-dealing government in Kosovo accused Serbia of hindering the issue. Djurić said then: “They are looking for access to the system of Telekom Serbia...I have no doubt that there are those who are trying to illegally tap the phones of citizens in this area.” That was all in August. Earlier last week, the talks were continued in Brussels. The news was the following: the deal presented to Serbia means that the parts populated by Serbs and Serbian enclaves in Kosovo will be limited to 2G technology without Internet and voice calls only – this was suggested by the “Priština side” but the Serbian side, of course, did not accept this. There have also been talks about locations for cell stations south of the River Ibar and about frequencies, which would directly mean that parts populated by Serbs and Serbian enclaves would be provided with the signal and coverage of the Serbian state telecom company, Telekom Srbija. It was announced that Serbia is ready to cede to the “Priština side” the use of one phone code for the whole geographic area. This would be possible if the assets of Telekom Serbia in the province are to be transferred to the daughter company and, if this is possible, in the case of its smooth functioning throughout Kosovo (which means that the property of the Republic of Serbia would stay in the hands of the Republic of Serbia). This is not suitable for the criminals from UÇK, Brussels, the US State Department, the Pentagon, and Downing Street. Belgrade was given a dead line until Sunday 9 to decide whether it accepts or not the "grotesque draft agreement on telecommunications" as Marko Djurić, the head of the Serbian government office for Kosovo and Metohija, said. He also announced that, although he supports the Serbian Governement unquestionably, he would resign from his post if the government of the Republic of Serbia by some chance decides to accept the legalized theft of its assets. There is no reason to be surprised by the behaviour of the US/UK/EU/NATO robots of various kinds. They are all from the same laboratory. They are all criminals and what they are doing is normal criminal behaviour. It would not be normal to expect something else from them. So, it appears that the arresting of Nehat Thaçi for terrorism on the territory of Serbia on the eve of the talks in Brussels on Serbian telecom infrastructure was not part of the fight against terrorism. It was a false flag event to pacify Serbs after the successful referendum in Republika Srpska and distract them from the talks in Brussels. He will be in jail for a while and then Vučić's bosses will demand his release. And, by chance or not, there are several things that happened last week just when it became clear that the “Priština side” will not gain its own country code so easily and when Serbia made it clear that 2G service without Internet is backwards in technological sense while the Alabnian parts would have 4G, LTE, etc. (perhaps provided by Madeleine Albright's company). The Mayor of South Mitrovica, Agim Bahtiri, organized a protest during which he called for the suspension of the Brussels dialogue to release the Director of the Kosovo Police Nehat Thaçi, who was arrested by Serbian authorities on charges of terrorism. Koha Ditore published this. Representatives of Serbs in the Kosovo government left the cabinet meeting today to protest the draft law on the Trepcha mine, noting that the Serbian community is excluded from the decision-making and that the entire process is politicized. Minister for Local Government Ljubomir Marić said it is irregular that the draft law was submitted to the ministers immediately before the government session. (Trepcha is also a Serbian asset in Kosovo and Metohija). Kosovo Prime Minister Isa Mustafa said at the government session that the Mining-Metallurgy Plant "Trepcha" is the property of Kosovo and it is non-negotiable with the Serbian side. But Vučić, who insults the Serbian population every day, defends the Albanians at the same time and unleashes rather idiotic phrases which mean nothing. And then he hires an army of bots to protect his image. If these bots were not illiterate, they might have some impact – whether words or swords, the effect is sometimes the same. The entire hierarchy is rotten from the US/UK/EU/NATO bosses to the smallest rats in front of their screens hired to save illusions. In their illusions, Serbian assets in Kosovo and Metohija do not exist. The newest ultimatum given to Serbia in Brussels shows that NATO's war against Serbia is still not finished. Wesley Clarke, the frustrated soldier, will never forgive Serbs for defeating his powerful army of robots. Serbia's Army was not technologically powerful, but Serbian commanders and troops were not mindless robots on drugs, but honourable soldiers protecting their country without breaking moral codes. Still, the hate of Madeleine Albright towards Serbs can not be explained, especially bearing in mind that her (Jewish) family was saved from certain death in camps by a Serb who was a friend of her father (a diplomat in Belgrade during WWII). This means that she is no more nor less than a sick murderer. It also appears that Serbian online bots, who are afraid for the public image of their Supreme Bot within the country, could not care less for the telecom assets of Serbia in Kosovo and Metohija. If they are all truly into activism, they should raise their voices and keyboards to protect their own country, built by their parents, grandparents, and their neighbours, and not protect Aleksandar Vučić, the sick and psychologically unstable political clown who cannot deal with his own inner and personal problems and was perfect for robotizing for precisely this reason. And now the entire population of Serbia laughs at him while listening to his daily TV tirades as if he were speaking at a visit to a psychotherapist. This is the only satisfaction that Serbs can have, since the current Serbian PM was put into power by frauds prepared together by Serbian Progressives and Democrats and EU bureaucrats. Now, he is selling Serbia further down the road. If the government of Serbia accepts the disgraceful offer which will wait until Sunday in Brussels, then this will be the last moment for people to wake up (if they can, since they are physically and mentally tired of everything) and send Aleksandar Vučić and his bosses to the disgraceful dustbin of Serbian history, and leave them there as examples of how traitors and cowards look. The US Vice President is bringing instructions for the new Serbian government.